Victoria's Secret has launched Love Star, a new fragrance for women. Love Star is a limited edition flanker to 2017's Love. Shine all season long in Love Star, a limited-edition sister to our original Love fragrance. The after after party. Bad behavior and good champagne. Temptation in the air. Dancing all night long. That’s the backdrop for Love Star. The fragrance opens with a shiny hit of Rosegold Apple. A flash of spicy-floral White Lily. Night Air, icy and bright against decadent dark Rum. Love Star is a fruity, floral sparklebomb. 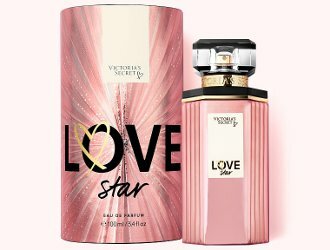 Victoria's Secret Love Star is available in 50 and 100 ml Eau de Parfum or 250 ml Fragrance Mist, and in matching body products. Victoria’s Secret is new to us in Scotland. Massive interest in the Glasgow opening and all good wishes for success. I was able to preview the store on holiday in Malaga. Great ambience. It is Hollister for underwear and fragrance. The pants (UK) are ok but you can buy similar in Primark for way less. The fragrances are sweeeeet. I am sure the package will do well but us older UK women will stick to M and S for our pants (UK) and Chanel for our fragrance. It did not start out as Hollister for underwear, but that is about what it is now.